With its membership now stable, the Collective Security Treaty Organization has shifted its focus to resolving conflicts and dealing with terrorist threats in the post-Soviet space, predominantly in Central Asia. The first attempt to create a security regime in the post-Soviet space was made 20 years ago. On May 15, 1992, the leaders of Armenia, Kazakhstan, Kyrgyzstan, Russia, Tajikistan and Uzbekistan signed the Collective Security Treaty, which Azerbaijan, Georgia and Belarus joined by the end of 1993. The member countries had more or less coordinated the direction they wanted to move the organization in by the end of the 1990s, but in 1999 Azerbaijan, Uzbekistan and Georgia refused to approve the extension of the treaty. At that time, Georgia, Ukraine, Uzbekistan, Azerbaijan and Moldova formed a geopolitical chimera called GUUAM in an attempt to show that the Moscow-centric post-Soviet space was falling apart. Where GUUAM failed, the series of “color revolutions” five to seven years later more or less succeeded in undermining Moscow’s influence in the region. However, the reduced CST format helped the remaining members strengthen the organization. They found many more common elements in their joint activities and later agreed to establish the Collective Security Treaty Organization on the basis of the extended treaty. Uzbekistan rejoined the treaty in 2006. The Islamic raids led by Juma Namangani in the fall of 1999 and the Andijan massacre of 2005 may have forced President Islam Karimov to reevaluate his attitude to the pro-Russian military alliance. The “rose,” “tulip” and other color revolutions swept the former Soviet republics in the late 2000s. Some of them were relatively successful, like in Ukraine, Kyrgyzstan, Moldova and Georgia; others fell flat (Belarus and Armenia), and the uprising in Uzbekistan was suppressed with unusual cruelty. Whatever the result, many leaders who had held their posts for years sensed that their position was not as secure as they had believed. A close military-political union with Moscow, which was worried over the “orange” and other revolutions, was a way to stabilize their political regimes. In 2009, the CSTO countries decided to set up the Collective Rapid Reaction Force (CRRF). The mandate of the joint combined-arms task force was greatly enlarged in 2011, adding an armed wing to a military bloc that had only existed on paper. Many CSTO leaders often hinted that the CRRF and other CSTO structures could be used for military/police interventions in support of the CSTO regimes, for example by suppressing internal opposition. “The point at issue concerns not only the use of the CRRF in case of external interventions, but also for actions within the CSTO’s borders, because no one will dare start a war against us while many would like to stage a coup,” Belarusian President Alexander Lukashenko said in August 2011 during a meeting in Minsk with CSTO Secretary General Nikolai Bordyuzha. 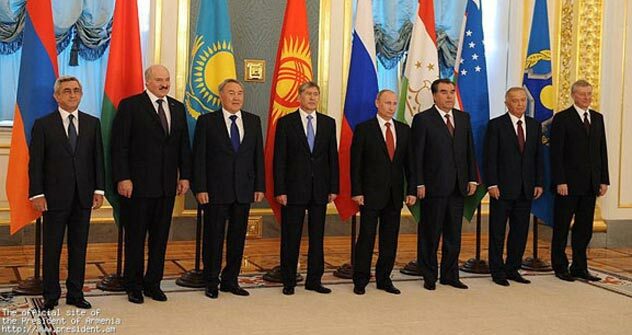 However, Lukashenko was clearly out of step with other members and definitely got his priorities confused. Moscow, which has been dropping vague but significant hints to its CSTO partners, clearly has its own vision for the CRRF. In the 2000s, the Russian military drafted a rough map of potential threats to the country. Against the backdrop of the reset policy in Europe and a tense but stable balance in Asia Pacific, Russia realized it would most likely have to intervene in an armed conflict in Central Asia. The international counterterrorism campaign, which has been underway in Afghanistan since 2001, has not reduced the threat of another Islamic raid similar to the ones that rocked the Ferghana Valley in 1999 and 2000. Russia’s sphere of interests in Central Asia has remained vulnerable in the past 10-15 years, as demonstrated by the seemingly stable but actually fragile political situation in Uzbekistan and the chaotic developments in Kyrgyzstan. Tajikistan’s stability directly depends on Russia’s presence and the NATO operation in Afghanistan. During the Center 2011 strategic military exercises, Russian troops worked with the armed forces of Central Asian countries, including in counter-terrorism operations. The Russian army made clear to the world that it is learning how to fight in Central Asia with the support of local allies. The CRRF was established as a multifaceted tool, but using it for purely police operations would be like using a sledge hammer to crack nuts. The 98th Ivanovo Airborne Division and the 31st Ulyanovsk Separate Airborne Assault Brigade are special units armed with heavy weaponry and trained in anti-guerrilla tactics. Russian troops were used to stabilize the situation in Kyrgyzstan in 2010. Public anger there was cooled by the deployment of the 31st Ulyanovsk Brigade at Russia’s Kant air base. In short, the CSTO received two pieces of news for its 20th anniversary, one good and the other bad. The good news is that the current CSTO members really need the organization and, therefore, have a stake in holding practical discussions of the organization’s future, its oversight bodies, and development tools and mechanisms. The bad news is that they may have to use the CSTO very soon.